This was a bit of a bummer, but then I had the best surprise ever: my second knitting book in the mail! 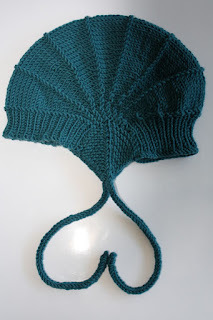 Vintage baby knits by Kirsten Rengren. 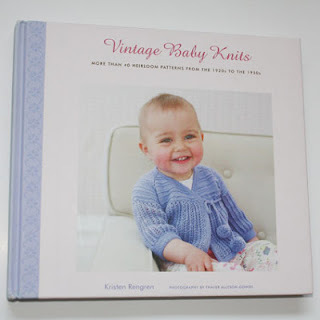 It is without a doubt the most beautiful baby knitting book I have ever seen. 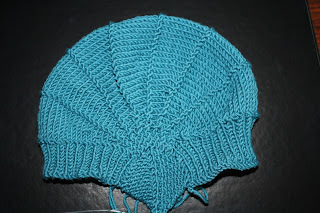 There are somanypatterns in there that I want to make, it's unbelievable. I am very pleased with the way it turned out to be. It fits my little one quite well. It's a little tiny wee bit to big, but he'll grow into it by winter time! I'm delighted about the I-cord straps. Like this I an more easily adapt them to my son's head. Instead of working to 5 stitches like the pattern said, I just did one more decrease on each side, resulting in 3 stitches and I went along and made my I-cord. I had heard about the Ravellenic games 2012 on Rvaelry before, but never really realized what they were. One day, a colleague of mine entered our office saying: "That website you visit sometimes about knitting has been sued by the Olympic committee!" Excuse me? I found out that it wasn't that bad, but the US Olympic Committee found the original games (that went by another name, combining Ravelry and Olympics - a name that cannot be named anymore) offensive to the athletes. The fact that women (and men) all over the world would be knitting and competing in it was found denigrating towards the sport athletes. Well I'm sorry, but what???!!! It was then I decided to join the Games :-).